De Next Centre Resorts is a 3-Star hotel located at 16/18 Olutosin Ajayi street, ajao estate, off Murtala Mohammed International Airport Road, Isolo, Lagos. It is close to the Airport and thus ideal for guests coming in or leaving Lagos through the airport to relax after or before their respective journies. De Next Centre Resorts offers spacious rooms with excellent facilities. These rooms are in the Single, Double, Double standard, and Mini Suite categories. 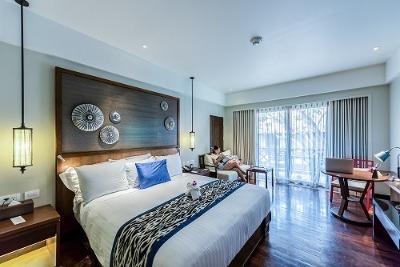 Each room comes with services like: luxurious bedding, desk and chair, television set with access to several local and foreign channels, coffee/tea maker, air conditioning, Mini Bar in the room, hair dryer, luggage storage and free wifi internet connection. De Next Centre Resorts also offers an array of great hotel services, which include: guaranteed security, free and adequate onsite parking of vehicles, restaurant, 24 hours electricity supply, round the clock room service, and a multipurpose event hall. Guests at De Next Centre Resorts also get treated to extra services like: an airport shuttle service, Laundry and dry cleaning services. Q: Does De Next Centre Resorts have an event hall? A: A large spaced event hall is available for hosting different kinds of events. Q: Is there a restaurant available at De Next Centre Resorts? A: De Next Centre Resorts has a fully functional restaurant to cater for the feeding needs of guests. Q: Is room service offered at De Next Centre Resorts? A: Round-the-clock room service is guaranteed at De Next Centre Resorts. Q: Does De Next Centre Resort offer shuttle services? A: Shuttle services are available to guests to and from the Airport and other designated places. Q: Is there a swimming pool at De Next Centre Resorts? A: No, there isn't a swimming pool in this hotel. De Next Centre Resorts Limited is a budget hotel in Ajao Estate, Lagos. My stay was good, great, wonderful, fantastic. In fact, what can i say? The environment was serene, the WiFi was fast and the customer service was so professional. It is one hotel I can recommend to anyone. I really love this hotel, I have being there several times. The staff were nice and perfect, i don't have any problem with their services. I really adore this hotel. Very nice airy rooms Cozy, comfy and just so pretty. The staff were so nice and welcoming, good services and facilities. I just enjoyed admired everything about this hotel. Constant light, neat environment and a perfect location. This hotel is also very secured as well, I felt really comfortable staying here. I would like to to visit this hotel again. I had a good stay. I found the hotel to be serene and quiet and that was important for me. I stayed for a brief period but it was nice. I don't have any complaint. I had a wonderful stay at De Next Centre Resorts. The hotel had a very good and serene environment, The hotel management and staff were lovely people. They were always ready to assist their guests and making sure they are satisfied. I got the value of the money paid. Have nice pictures of De Next Centre Resorts Limited?